The resolution was reported to have begun during President Trump's world tours. During his first tour in early March, Trump visited Asia travelling to Japan, South Korea, China, Vietnam, and the Philippines discussing major issues of diplomacy with officials. The second of these tours went through the Middle East, Vatican City, Belgium and Italy during May of this year with a similar agenda on the itinerary. It was within these meetings that the topic of North Korea is said to have been a major focus. During these tours, President Trump was reported to be engaged in major efforts toward world cooperation and mutual peace, and as things appear, the efforts are paying off significantly. 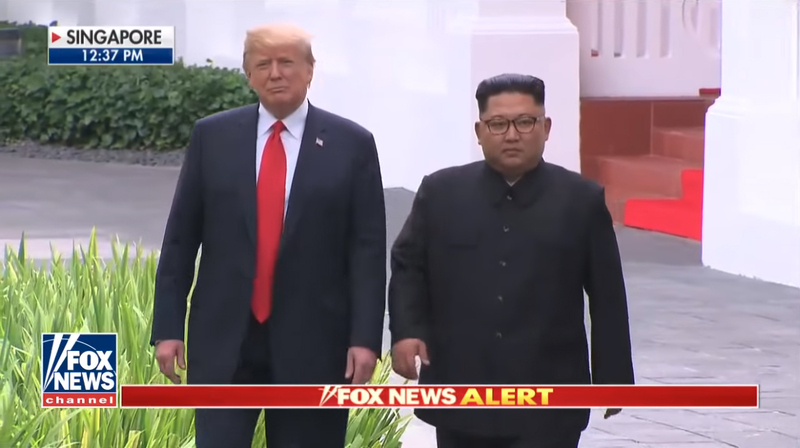 Here are the various reports from Fox News on the major points of this historic moment for the Korean peninsula and the world. If this progress is truly genuine, we are living in historic times. Many may have thought it impossible for Donald Trump—a man who is despised by a host of seemingly immoral and unethical figures—would be able to do something so undeniably positive for the world. This achievement flies in the face of much of what the bias (and often unprofessional) corporate media has claimed about the President thus far, and though this act does not excuse any possible detrimental acts which the President may have committed over the past two years, this moment definitely challenges many haters in the MSM to eat a slice of humble pie. It seems clear how the American media has digressed into the state we now see it. We may have noticed the stark contrast of respectfulness demonstrated between the press of Singapore and the apparent hatred which some American press members have for President Trump. Even after this historic event, one press member took her opportunity for questions to berate President Trump as though he were doing something evil by working to create peace in East Asia. Other American press members complimented this initial disrespect by either attempting to digress from the progress made at peace talks or by expressing doubt that any good had been done, despite the evidence that has already come forward. It seems as though the American media has devolved into a war-bent tabloid stand eager to smear their sworn enemy—President Trump—any way they can. It is as though they hate the idea of peace and that it pains them to see the man they have chosen to hate bring peace to the world where previous Presidents have failed. Nevertheless, it appears as though this progress is genuine and that President Trump has helped to begin an historical trend of progress for the world. It may be that the American MSM is upset that they now have to eat their own words. However, there is not much of a way for them to trash the President in this case without ruining the remainder of their own reputations. As stated by President Trump, there does appear to be progress made. However, time will tell whether or not Jong-un is serious. It does appear that the N.K. Prime Minister intends to follow through with his agreements and to disarm his nuclear arsenal for the sake of peace. It appears that from his speech, President Trump has a lot of positive vision for North Korea, its people, and the Asia Pacific as a whole. The three months of preparation which preceded these meetings appear to have been exceptionally effective even in their down time. However, according to sources, the reason behind the peace deals was not entirely the diplomatic side of these efforts. According to an article written by Dr. Michael Salla of Exopolitics, the peace settlements were achieved due to Kim Jong-un's realization that he had been betrayed by the original powers which gave him nuclear capability in the first place. Within this article, Dr. Salla explains how the elitist crime syndicate known as the Cabal originally gave North Korea nuclear capability and set them on a path of terrorism and intimidation. For years, N.K. was used as a global scare-monger lobbing threats and launching missiles into the Pacific Ocean. It was not until the reported false missile alarm which was set off in Hawaii that Jong-un began his change of heart. According to the source Q Anon, the Hawaiian missile incident resulted from an actual missile launch. This launch was initiated by Deep State operatives in the Pacific and was intended to frame North Korea as the attackers in order to start a nuclear conflict between N.K. and the United States. When Jong-un realized that he was being scapegoated, he decided to abandon his nuclear program and seek terms of peace, according to the article. On top of this false flag missile launch, North Korean officials were made aware of classified technology within the arsenal of the U.S. Air Force called the Rods of God. These rods are reported to be satellite-based weapons platforms located in low Earth orbit. If the Air Force saw it necessary, they could easily deploy these weapons to neutralize any North Korean threat before they were able to launch. These weapons played a major role in helping to negotiate peace on the Korean peninsula, and I am sure many of us are grateful that two world leaders chose diplomacy over any conflict.